It's an interesting moment every time I meet someone who recognizes me from Jalopnik. "Hey! You're Doug! From Jalopnik!" they always say. "The guy with the Ferrari and the CarMax Land Rover!" And then, in all their excitement to learn more about the industry, and all their eagerness to talk about cars, they invariably ask the same first question: "Why do you always wear the same shirt in all your videos?" No, I'm just kidding. Sharp-eyed readers will notice that I don't wear the same shirt in all my videos, but rather several different shirts (not at once) with subtle variations. It's changes like this that keep readers on their toes; eager to come back for more. This, and the fact that maybe in one video I'll crash my Ferrari. No, what readers usually ask when they meet me is: How's the Ferrari? I find this a bit odd, considering that I've been writing about the Ferrari every two weeks since January. But I've learned that you can't predict the behavior of readers; especially the ones who e-mail me. And anyway, what I've discovered is that readers who ask me this question don't want to know what I've done with the Ferrari. They want to know how reliable it's been. After all, there's a perception that all Ferraris are poorly-engineered, unreliable Italian pieces of crap, brought on by the fact that most Ferraris are poorly-engineered, unreliable Italian pieces of crap. And so I think some readers sort of assume I'm hiding defects with my car in order to make this whole experience seem more exciting. There are two reasons why I'd immediately announce any Ferrari-related defects. Number one is that it would give me something interesting to write about. But most importantly, it would be exciting to witness unrestrained exuberance among the people who hate my Ferrari. The moment I announce the problem, they'd reply with comments like: "HA HA! You have to have your brake light replaced! My mom's Mercury Topaz has never had its brake light replaced! A Mercury Topaz is better than a Ferrari!!!! MERCURY TOPAZ FTW!!!" This is the sort of logic you can expect from Mercury Topaz owners. 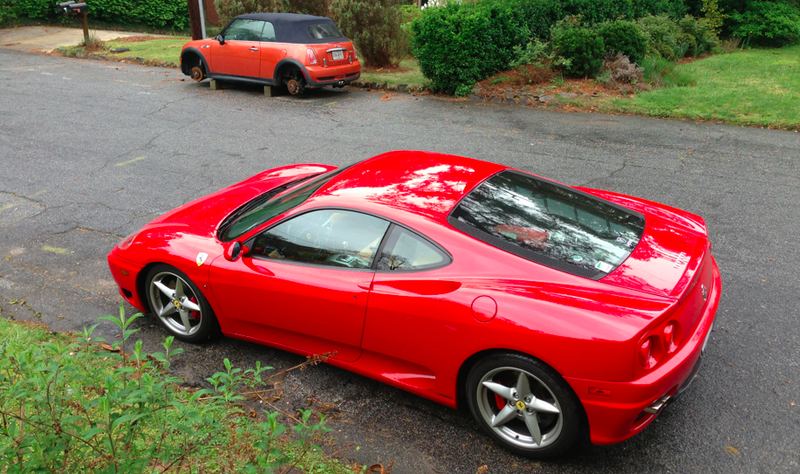 But the simple truth is this: the Ferrari has been the most reliable car I've ever owned. But the Ferrari hasn't just been exotic car reliable. It's been actual car reliable. I say this because I've already driven the Ferrari approximately 4,500 miles in the six months I've now owned it, and I haven't had a single problem. That may not seem like much driving, but it's an enormous total for a Ferrari. Most Ferrari owners drive approximately 11 miles per year, and those 11 miles are the sum total of each time they move it in and out of their driveway, where they polish it with a diaper. But since then, not one issue. Not one failed start, not one check engine light, not one rough idle. Not even one situation where I heard a weird noise and spent the next four nights tossing and turning and worrying about why the Ferrari dealership charges a higher hourly labor rate than my accountant.